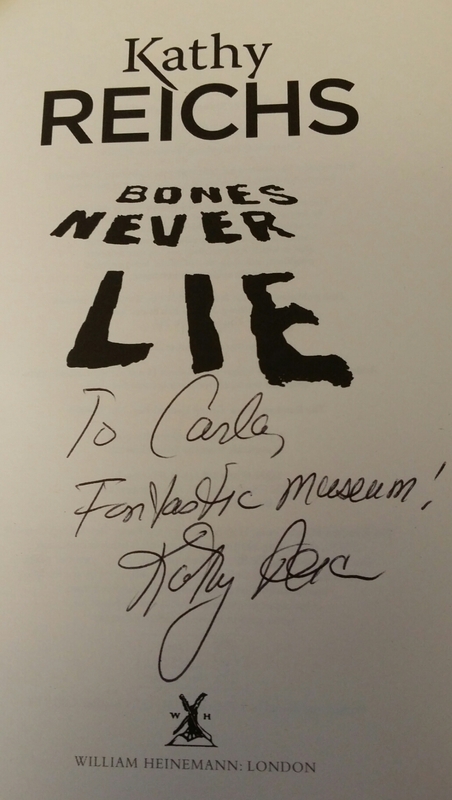 Reading the latest ‘Tempe Brennan’ offering – Bones Never Lie – on the train home from work last night, it still hadn’t quite sunk in that I’d just met one of my idols at Barts Pathology Museum. This latest crime thriller is her 17th Tempe Brennan book, and I’ve been reading the series since the first, Deja Dead, was published in 1997 (which makes me feel incredibly old!) Back then I was immediately entranced by its gripping, dramatic plot which waltzed effortlessly with the realistic scientific content, as though the two – fact and fiction – had always been accomplished dance partners. 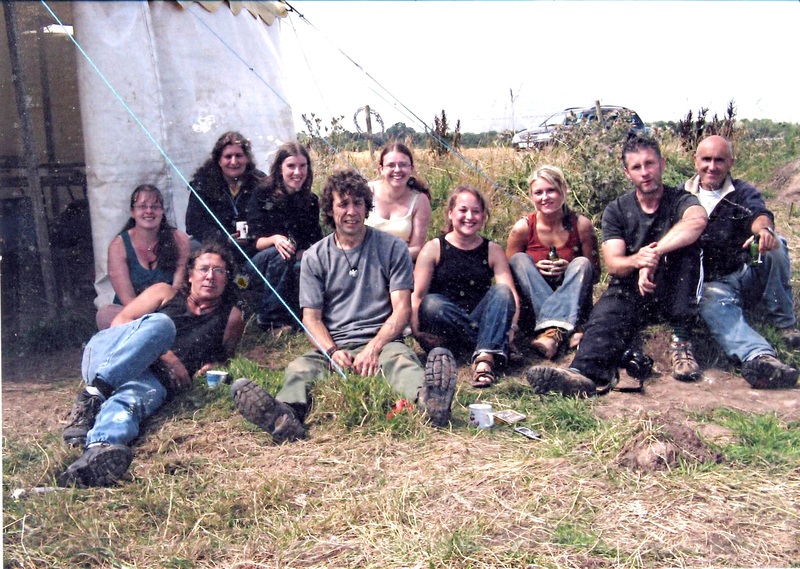 As a Forensic Science student, it was thrilling for me to be engaged in the unfolding story at the same time as learning true-to-life analytical procedures, and it shaped my decision to take some Forensic Anthropology modules as part of my degree. Far from just being an awful of a lot of fun, the Forensic Anthropology short courses (and subsequent MSc I enrolled on) were useful when I found myself working in a mass fatality situation: the July bombs in London (7/7). As an APT I worked directly with radiologists, pathologists and anthropologists to identify the remains of the 52 victims and 4 terrorists in a crazy two week period of 13-14 hour days. The anthro courses prepared me for the work flow and work load of a temporary mortuary even though much of my studies had been on historic mass fatalities like mass graves in the former Yugoslavia and Rwanda. The temporary mortuary was set up at the Honourable Artillery Company on City Road and just like that I was back in a military environment once again, although with a lot less camaraderie and a real sense of duty to UK citizens following the harrowing attacks on London’s transport system. My anthropology courses and connections also took me to an excavation of plague skeletons in the Venetian Lagoon – the quarantine island Lazaretto Nuovo – which made headlines in 2005 when the skeleton of a suspected ‘shroud-eater’ (a type of vampire) was discovered. I’ll elaborate on this in a future post…. I got so many mosquito bites on this dig my eyes swelled shut. ‘Action’ shots of me on Lazaretto Nuovo when I was a lot less tattooed! 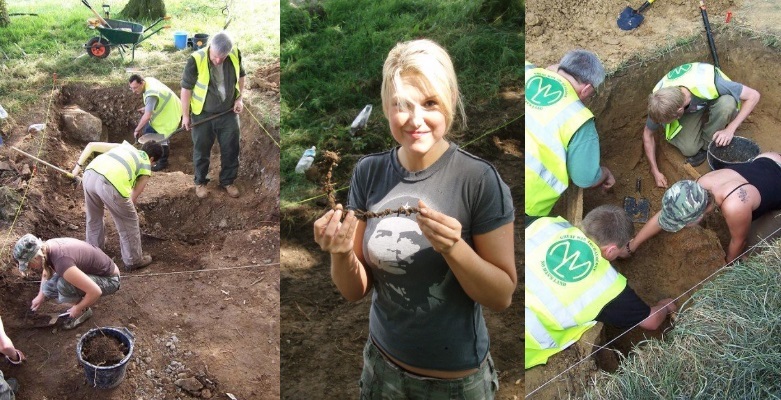 I also excavated WWI soldiers in Messines, Belgium and spent some wonderful months on the Poulton Research Project in Chester. I realise many of these photographs are of me poking around in dank, dark holes and not much changed when I became a fully qualified mortician! Nowadays my skeletal interaction tends to be more fragmented and a lot less dank and dark since I curate the specimen collections here at the museum. We have hundreds of osteo specimens including syphilitic skulls and radii riddled with rickets! 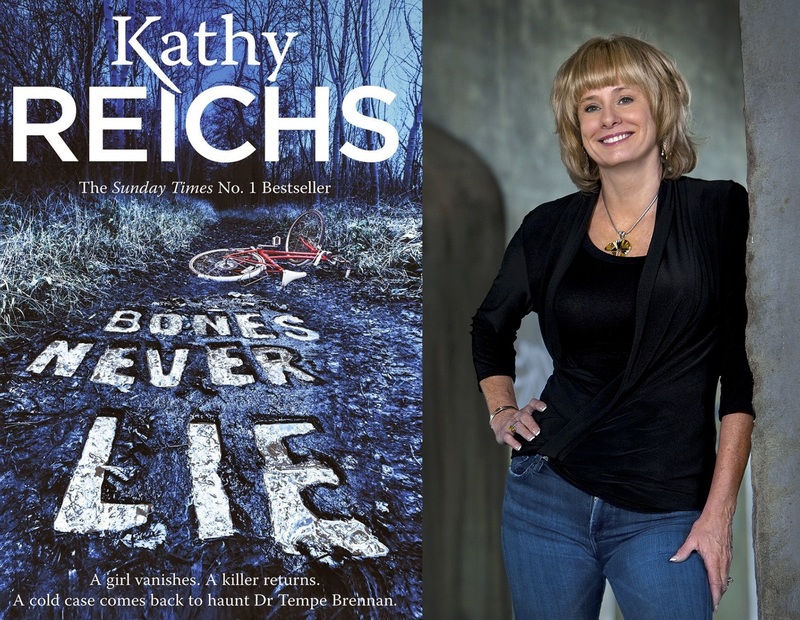 For that reason I was thrilled at the prospect of Kathy Reichs coming here to engage our visitors and her fans with real bones. The event was incredible and thankfully she never noticed any mistakes in our labelling 😉 After an unexpectedly funny and very enlightening presentation there was a Q&A session with questions even coming in via social media, then Kathy did a meet and greet with fans, signing books and taking pictures. I came over all ‘superfan’ too and had my book signed. The event sold out in around two hours when we first released tickets but it was filmed for those who couldn’t make it and the link to see it is here. It goes out at 5pm on September 17th – I hope you enjoy! We often have authors releasing books here at the pathology museum as it’s such a wonderful inspiring space, so do check out our events list. Of course if you’d like to know more about my previous career in mortuaries there are still a few tickets left for my lecture which kicks off our autumn season so come along and say ‘hi’, have a glass of wine, and learn about what mortuary work really entails.